At the recent EdTechXAsia 2016 event, an eminent speaker confirmed what all have been witnessing: contrary to initial fears, technology has not replaced teachers. But, he warned, “teachers proficient with technology will very soon replace those who are not.” The speaker knew what he was talking about : he was none other than Dr. Janil Puthucheary, Minister of State at the Ministry of Education of Singapore, the country that topped all global PISA rankings in 2016. The digital leap and the rise of the (good) teacher are two of three current mega trends that we previously explored while reflecting on the future of language learning. These two phenomena are intertwined. With the coexistence of Man and Robot, there will be dramatic adjustments and power shifts. There will be winners and losers. At this stage you may be wondering what to do to remain off the endangered species list. We very much agree with Dr Puthucheary’’s view that teachers’ inherent value is increased by their ability to leverage technology. As a facilitator in an enhanced learning environment, the tech-enabled teacher offers more and better learning choices to her students. But this is only the beginning of the story. The rest of the story is that many teaching tasks are now performed better by machines than they are by humans. “Better” can be understood as more consistently, more accurately, more effortlessly, more teaching-effectively or more cost-effectively. Is there any need left for humans when it comes to enunciating a grammar rule, teaching vocabulary, drilling, correcting pronunciation, consolidating knowledge? There isn’t. As a matter of fact, when a teaching task can be fully and unambiguously described as “specialized, routine, predictable” (as Martin Ford, the author of The Rise of the Robots, put it in 2015), chances are machines have already taken over. 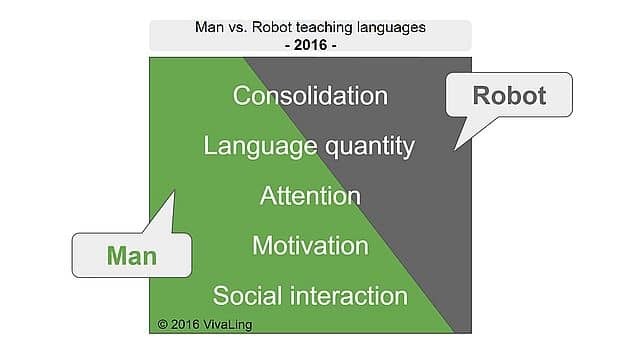 The saving grace for teachers is that several of the language learning drivers (as introduced in VivaLing’s ViLLA © ) remain much better activated nowadays by Man than they are by Robot. Let us go over these language learning drivers, from the least to the most favourable of Man over Robot. Consolidation. In addition to the natural occurrence during sleeping phases, knowledge consolidation happens when memory is retrieved at the right time and in the right manner. Robots are already more effective at implementing well-known spaced repetition algorithms. They are also improving at memory retrieval techniques which diversify the ways a given piece of knowledge is tested, activated or reinforced. Language quantity. Computers are already tireless when it comes to offering unlimited language input to learners. Their ability to bring about learner output i.e. language production, however, is more difficult to control. As to providing feedback, today it can only happen in very structured environments such as Multiple Choice Questions or True / False questions, but not in natural language. Attention. Is the learner’s attention wandering randomly? A teacher can help them focus on the right elements. Machines can too, when highlighting specific elements to focus on. But the risk remains that the learner’s attention will just drift away, in the absence of a “big brother” watching and with the computer environment sometimes even adding to the distraction. Motivation. Machines have already made significant progress to satisfy extrinsic motivation by providing badges and rewards. But humans still have a significant edge by the timely and adapted encouragement they can provide with the right choice of words and body language. They can also outperform machines in personalization (content and pace), which greatly enhances learner motivation. However truly adaptive learning is high on robot makers’ roadmap and catching up fast. Social interaction. This is where the ultimate human advantage lies. Social interaction is an absolute requirement for younger children, and strongly recommended for true communicative language learning at all ages. As long as robots cannot fool children, human teachers will remain more effective at teaching. A few weeks ago, a famous US language app at the leading edge of technological disruption launched its chat bots. But after trying them out, we were surprised to note that these bots chat only in writing and in a rigidly structured context, make unexpected grammar mistakes and even used … suspiciously flirtatious vocabulary. They are still very far from matching authentic human interaction. 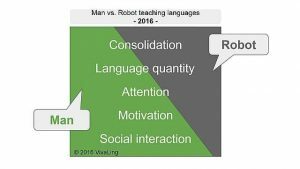 When adding a historical perspective to all the language-learning drivers, it becomes apparent that Robots are increasingly encroaching on what used to be Man’s exclusive teaching territory. 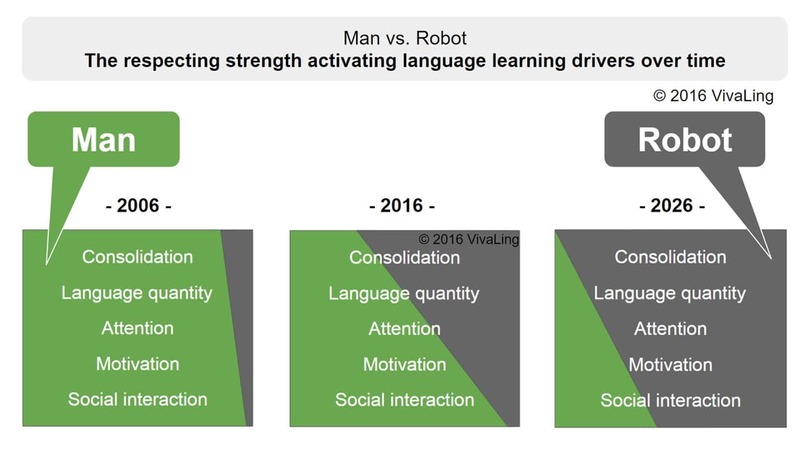 For some drivers, such as consolidation or language quantity, the Robot has already made huge inroads and will soon undeniably and irreversibly overtake Man. Regarding other drivers, such as social interaction, Robots are further or even much further off. But let us keep in mind that Google’s AlphaGo beat the world’s best Go player in the world decades before it was anticipated. Artificial intelligence is making steady progress and it will most likely take no more than a generation or two for a bot to fool a child language learner. It is even more important today for teachers to master the technology that is available, and to elevate their teaching skills to specific domains and levels still protected from the rise of the Robot. If a teacher is simply requested to deliver a pre-scripted lesson without being able to deviate from it, let there be no mistake: the teacher will be replaced by a Robot before they know it. But if they nurture the pedagogical expertise and social skills to truly offer a superior language learning experience to the learner, they will thrive. Teachers are not naturally equipped with these skills, and are not sufficiently prepared to embrace their human advantages in traditional teacher training programs. 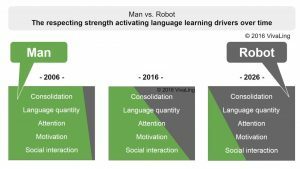 This is why programs such as VivaLing’s VOLT-YL for teaching languages to children online are progressively preparing them adjust to the fast-changing teaching paradigms. Christmas all over the world is celebrated on Christmas Day, the 25th of December. Some countries however have different Christmas traditions and Christmas celebrations take place over a longer period of time. Discover how the VivaLing coaches live Christmas around the world. My great big family (about 40 of us) getting together to make a special dish and then playing games with presents. Each person had to bring a fun gift wrapped in newspaper. We could exchange our gift if we wanted to. With 40 people the game lasted quite a while and there was a lot of laughter. Preparing and eating dessert. My sisters and I try to outdo each other each year, whether we are buying or making the dessert. Last year, I contributed rich chocolate mousse cake in the shape of Christmas crackers. It was delicious and really sought after. 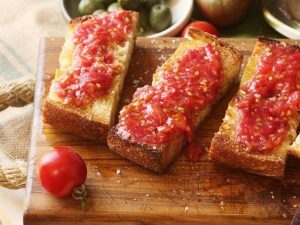 My sisters and I are close and love cooking, so the competition is healthy and fun. What do you usually eat on this occasion? It’s high summer in South Africa yet we still insist on food that has been influenced by British traditions so we often eat roast meats, roast vegetables and rich desserts such as trifle and Christmas pudding. However, we also add a South African flair to it by having a braai (babarque) grilling meat and eating salads with them. What do you usually eat for this occasion? I’m the oldest of four children. We used to get very excited about the presents. We woke up really early in the morning to open them all. One year, we went a step too far and woke our parents up at 4 in the morning! After that episode, our parents told us to wait until 7 am to wake them up. But we still woke up really early and the 4 of us would just sit on the couch in the living room watching the presents with only the Christmas tree fairy lights turned on.. This endless wait in the semi-darkness, with my brother and sisters, is my best Christmas memory. I lived abroad for a few years and still live far away from my family, so to be with my family for Christmas is what I like the most. 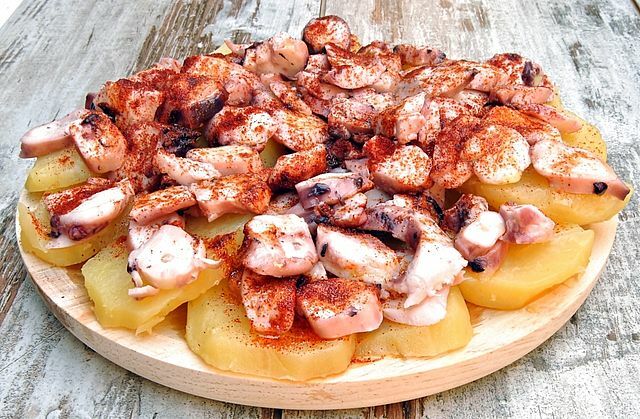 We normally eat some of the following meals: foie gras with onion jam and gingerbread, smoked salmon, homemade tarama, snails, a turkey or a platter of seafood (my family lives close to the sea and my brother-in-law is a fisherman!) And of course a “bûche de Noël”. However, this year, for a change, we will have the “13 desserts provençaux”. As a Chinese, Christmas for me was just a great holiday for shopping: all the big malls have great discounts during that period. Until I moved to Europe, I didn’t know the real meaning of it, I hadn’t felt the festive vibe. In Europe, Christmas is really a family festival just like the spring festival in China, regardless of religion, this holiday is for everyone. Now that I live in the Netherlands, I play “secret Santa” with my family and friends. We exchange gifts, and most importantly, we get together and have a big Christmas dinner. Another thing I really love about Christmas is decorating the Christmas tree. I never expect that it could be so much fun to make your own Christmas tree. I feel like I am a little girl again. I usually go to the Christmas market to buy a lot of beautiful ornaments for my tree, then I set it up and turn the lights on. I feel as proud as when I make my own “Chinese new year dinner”. “What language should my child learn?” This is the recurring question for parents, when choosing the first or second foreign language for their child. The question is complex and the answer is difficult to give. This type of choice depends on various individual and family criteria. Nevertheless, the following criteria will help you to make a wise choice. The best foreign language to learn is the one your child will learn successfully. And motivation, as in any other subject, is one of the most important factors when it comes to successful language learning. If your child learns a language because he or she knows that he or she will need it in the near future (to feel comfortable on a foreign vacation or to communicate in the country that you are moving to) or the distant future (to enter a specific school or to study abroad for a specific job), then his or her motivation to learn will be what is known as “extrinsic motivation”. But there is another type of motivation that plays a major role in learning a language, and this is known as “intrinsic motivation”. Communicating with a friendly teacher, receiving positive feedback, experiencing joy and pleasure in conversation, and feeling the progress made in a new language are all learning engines. It is important to note that no amount of books read or movies viewed in the target language can ever replace communication with a genuine, native interlocutor. 1- Mandarin, which is the most widely spoken language in the world today. It has nearly 860 million native speakers and 450 million people who speak it as a second language. 2- English, which is the first official language of a hundred or more countries. Native English speakers total around 425 million, distributed across every continent. English is also one of the most influential languages because, apart from being an official language, it is also the “first second language” chosen by nearly 750 million people. 3- Spanish, with about 340 million native speakers. In addition to Spain, Spanish is spoken in nearly 31 countries, most of which are in Latin America. Some languages ​​are more difficult than others to master. For example, an English speaker will need an average of 2,200 hours, or 88 weeks of lessons to speak something of Japanese. The Chinese, the Arab and the Korean take about the same amount of time. Conversely, it is estimated that it takes 23 to 24 weeks, or 600 hours, for an English speaker to achieve the same level in Spanish or Italian. But whatever language you learn, exercise is always excellent for the brain. Learning Chinese, a non Indo-European language, with radically different language patterns has a very positive impact on a student’s comprehension of language in general, thus indirectly improving his or her knowledge of other languages. This has been highlighted in a study published in 2016, in the journal Nature: the more languages ​​we learn and the younger we learn them, the better equipped we are to learn new languages. So there’s no time to lose! Let your kids start learning a new language today. They will be eternally grateful to you.